We are pleased to present this interview with John Klein, a notable blogger and community activist in Regina, Saskatchewan. He has been nice enough to answer our philosophical and practical questions about the most important issues facing our society today, and what each of us can do about them. You can follow John at his blog “Saskboy’s Abandoned Stuff”, focusing primarily on local and regional events, opportunities, and issues in Regina, Saskatchewan, and Canada. However, his interests are broad enough that his blog has been known to wander into every subject from high-tech development to economics to religion. Just as on Vision of Earth, readers there are encouraged to voice both their support and criticism of ideas presented. Well-informed readers will note that this interview refers to a minority government in Canada. This interview dates to early 2011 before the Conservatives gained their majority. We contacted you for this interview because we know that you have been involved in community efforts towards sustainability. Can you tell us a bit about your background and experience in this area? I’m involved in as much as I make time for, everything from blogging about environmental sustainability, to participating on the executive of a car sharing co-operative, to ad-hoc recycling and reuse projects. I’ve always been interested in recycling. When I was a kid, I’d pick up discarded drink bottles to collect the deposit money. When I lived on my own, I’d sometimes make a trip around the neighbourhood to collect and flatten boxes out of dumpsters so they could be recycled, and more recently I’ve rescued hundreds of kilograms of reusable items out of Regina’s dumpsters and found new homes for the goods. Tonight I saved a large coffee table for a friend, and have recently repaired a clothes drying rack, which can be used by someone to further reduce their carbon footprint by eliminating some clothes dryer cycles. My family has recycled various things for as long as I can remember. My parents inspired me to care about other people, animals, and our environment. I think you have to take care of the environment as best as you can, to show you sincerely care about the future world that next generations will live in. Do we want it to look like Blade Runner, or like Star Trek? The greatest challenge today is standing up to corporations that dictate global political and economic policy, and instead send more of our money to local producers, craftspeople, tradesmen, and technicians. No matter how much we might want our laws to change, we can only make change peacefully and quickly if we have better politicians that share values with environmentalists. If we can’t find politicians to support changes because their careers will be ended by competitors with questionable ethics who are funded directly or indirectly by companies like BP, Walmart, Target, or Burger King, then we are left with distasteful means of causing changes to our economic and political systems. The American and Canadian political systems are designed not to give a loud voice to minorities, and that may have been partly responsible for keeping our continent so peaceful for so many decades. However, we are reaching a point where many of our assumed societal norms are becoming variables. What worked in the last 50 years, may be our undoing in the next unless we can adapt quickly. Our climate is changing, our Parliament is continually in a minority situation, Canada has been at war for nearly a decade, Alberta’s north is a globally famous tailings pond which is spoiling the image of our country, and our government opposes environmental policies that are no-brainers in most of the developed world. It would be morally wrong to do nothing when there is so much suffering caused by pollution that is entirely preventable through legislation, a bit of education, an improved economic system, and a little hard work and ingenuity. The fate of the future literally rests on the policies we support and the articles we purchase today. There is low awareness of this issue. I’m not sure why my education was so different from so many other peoples, and I find it almost maddening that most people don’t see the crises that are looming in the next decade. I work at a university, which I feel is my best contribution to making the world a better place, even though it’s an indirect way of doing so. 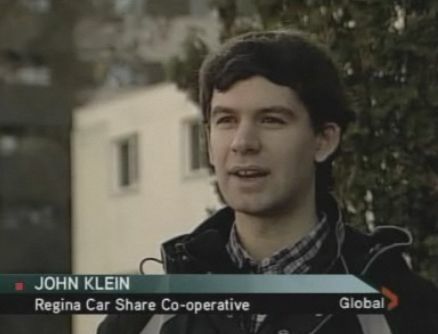 I also volunteer as the president of the Regina Car Share Co-operative, which is an organization that is attempting to have a direct impact on improving the environment and transit system of Regina. When elections roll around I volunteer with political parties that I feel have a grasp on reality and oppose the current government’s candidates (and others that don’t have environment and citizens at the top of their priorities list). I feel I could do more to make my workplace a more earth-friendly institution. For instance, years ago I envisioned convincing the local McDonalds restaurant to recycle their many cardboard boxes that their wrapping comes in. After working there a few months, I saw it’s difficult to change a workplace, both due to logistics, and corporate culture. As a New Year’s resolution, I aimed at spending more of my money at businesses I want to see succeed, and less at those I want to shrink. As a result, I’ve shopped no times at Walmart in 2011 thus far, I’ve been to Superstore once with my fiancé, and I’ve done most of my grocery shopping at Eat Healthy Foods, and Nature’s Best (organic and local foods stores). I feel better about the food I’m eating, places I want to see stay open have hundreds of dollars more in their win column, and thoughtless corporations get less of my money. It’s a triple win from my perspective, with just one small change. Be the change you want to see in the world. Ghandi said that; Google tells me so. He was an expert on change, and getting what he wanted. Most people don’t need to go on a hunger strike or lead a nation to make big changes, they simply have to start respecting themselves as an agent of change for either right or wrong. If after an evaluation of yourself, you find some action lacking in good taste, take a step to change it right away. You don’t need money for change, you need determination, friends to encourage you, and time to evaluate your direction. Thank you very much John for your time and insight!